On the Sunday after the NCAA National Championships last spring, the members of UCLA women’s gymnastics team got a text as they arrived back home in Los Angeles. “Team meeting, 7 a.m.,” it read from their coaches. “We all were like, ‘What? This is the Monday after Nationals,’” recalls sophomore Kyla Ross. 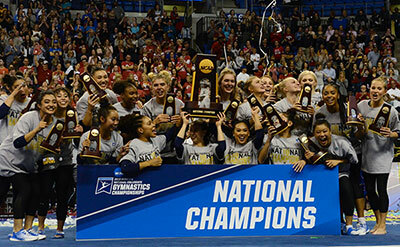 But what transpired at that meeting put in place the first building blocks for what would culminate a few weeks ago at this year’s Nationals: The Bruins winning their first national title since 2010. With Kondos Field at the helm at UCLA for 33 years, the team has won seven national titles. But for that 2018 title to become a reality, it took the buying in of a squad that knew it had to execute a game plan outside of the gym – and not just in it. It also took some near-perfection in the final moments of NCAAs to secure the win. But more on that later. What was eventually waiting for UCLA at the end was that national title, but that wasn’t apparent during that 7 a.m. meeting last year, nor at the beginning of the season, when the team struggled for its first 10 meets to put together what Kondos Field says was a strong meet in all four events. But the decision to stick together and hold one another accountable outside of the gym is what they all feel made the difference, and Kondos Field says it also created a greater sense of community: Normal team meetings held to address issues and incongruities didn’t happen this year. Not once. The team was doing plenty of talking outside of the gym – but about working as a unit: Their group chat on their phones arranged study sessions and workouts. Upper-class members of the team often invited the younger ones over to cook healthy meals at their apartments. “Usually, it’s hard to get the whole team on board, but the freshman class was really good with that,” adds 2013 American Cup champion Katelyn Ohashi, a junior who finished as co-national champion on floor doing a Michael Jackson routine that went viral midway through the season. Kondos Field credits the more veteran members of the team for creating that culture, but also nods to a move she and her staff made last year: All freshmen would room with a gymnastics teammate, the first time they had done so in Kondos Field’s tenure. While risky, the close quarters created a greater sense of community. It was similar to a move that Georgia had used during its run of five straight titles from 2005-09, and Kondos Field didn’t hesitate from taking a page from the playbook of that program’s storied head coach, Suzanne Yoculan Leebern. A story about a team turning its culture into that of champions reads a bit like a Hollywood script, but none of that could hold true if it didn’t get the true Hollywood ending in St. Louis at Nationals, when the squad thought for much of the meet that they were competing for third or fourth. “We’re told not to look at the scores on the big screen, so we literally had no idea what was happening from vault [the second event] on,” Ohashi recalls. But what was happening was UCLA was climbing the ranks. After floor and vault, the team had a bye rotation and then went to uneven bars and beam. Few – if any – understood that they had the chance to win the national title outright if they turned in knockout performances in those last two events. Even Miss Val was at a loss. The final crescendo was the biggest: Sixth-year senior Peng-Peng Lee stepped up after Ohashi and Ross hit and delivered with an exclamation point, putting up a perfect 10 beam routine. Overwhelmed at their flurry of a finish, UCLA waited for the scores to pop up. But Kondos Field knew they had won: The TV cameras at the meet were rushing over to them. The producers knew what the scoreboard didn’t show yet: UCLA was set to become national champions. “It’s still surreal,” Ohashi says two weeks later. And it was a fitting finish for Lee, a gymnast that Kondos Field had met when she was just 10 and had been recruited by UCLA during an injury-plagued season in high school. Her coach is overjoyed in speaking about Lee going out on a high the way that she did, but also says it was her approach during her career at UCLA: Don’t hold back in the big moments. The one person who wasn’t hesitating to look at the scoreboards – or do the math – at NCAAs was UCLA associate head coach, Chris Waller. Midway through the meet, after floor and vault, he took the team into the locker room for their bye and delivered a stirring speech that virtually no one knew had a hidden undertone: We can still win this thing. “Chris came in and gave this Rocky Balboa-type of speech, and it felt like we were going to go out with this blaze of glory,” Kondos Field recalls, laughing. It was a fitting finish for a team that had left no stone unturned since late April last year. In the end, UCLA beat two-time reigning national champions Oklahoma by just 0.0375. Winning national titles is fun, too, and Waller did an encore of his speech this past week at a championship celebration on campus at Bruin Plaza. The team all smiled and laughed along, but it was a reminder of the commitment that they all had made that Monday morning in a building just steps away. It’s truly the little things that built this big story, however. And – for UCLA – the buying in of a culture where the work doesn’t stop inside of the gym. So, when’s that meeting for next year’s team?